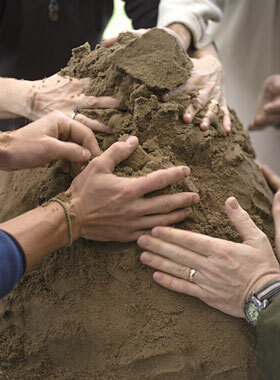 HOW MANY PEOPLE DOES IT TAKE ….. TO BUILD A CLAY OVEN? I have been interested in wood-burning bread ovens since seeing one in action on a visit to Australia and when I returned home and began baking my own sourdough bread, this interest turned into an obsession. I fully intended to build an oven in the garden this last summer, but other obligations and rubbish weather meant it just didn’t happen. Even my sourdough starter has been rather neglected lately and is currently sitting at the back of my fridge waiting to be invigorated. 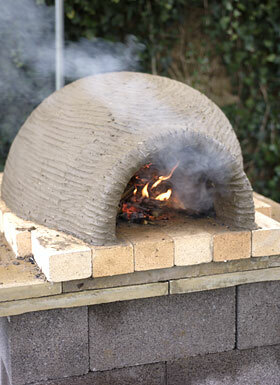 However, I am all fired up after this weekend attending a ‘how to build a bread oven’ course, held at Taurus Crafts, just down the road from where I live. The course leader, Warren Lee Cohen, is a very experienced bread baker and oven builder and he set out to pass on his knowledge and enthusiasm to a group of us eager to learn. 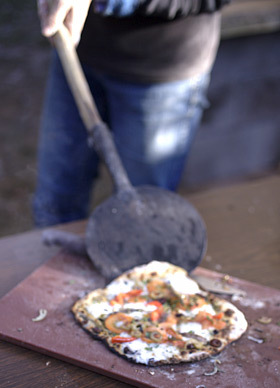 During the course of Saturday and Sunday, 16 of us collaborated – the plan to build 2 ovens; one under a beautifully constructed wooden canopy that would become a permanent feature at Taurus, the other a slightly more modest affair that we would be able to fire and bake in by the end of the second day. The domes of both ovens were made of cob, a mixture of clay, sand and straw, that had to be layered on a groundsheet and then trod, by booted foot (it was just too cold to use bare feet, but apparently you can), to form the correct working consistency to form into bricks. One by one they in turn were then wacked around a mound of sand, manipulated and stroked to seal the gaps between until it all came together to form a domed oven. Of course there was a little bit more to it than that, but not much. What was so utterly brilliant was the simplicity of the whole thing. The second oven was made to be be more substantial, had thicker walls, a beautifully crafted oak door so that the oven could be used for baking loaves and was moulded and tended with loving care. The other oven was more basic and though it would have benefitted from a longer drying out time, was fired up by the end of the first day so it could begin to dry out sufficiently for us to bake our pizzas. Warren’s approach to sourdough was also surprisingly casual. I have written before about the trials and tribulations of working with a wet dough, getting to grips with hydration and how buying some digital scales and using precise accuracy with weights and measures helped me crack it. Warren doesn’t weigh anything, instead gets the feel of the dough and uses his instinct and experience. It seems a very relaxed way of doing things but I wasn’t the only one who felt slightly traumatised by the thought of simply going with the flow. This approach was refreshing though, after the complicated techniques described in my many books on the subject and proves that there is more than one way to do these things successfully. He had brought in some sourdough for us to use for the pizza bases, which was given a quick kneading in the morning and was ready to use by lunchtime. By the time we got round to baking, I was starving. 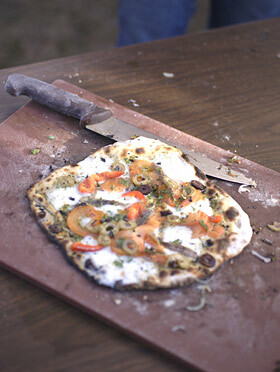 We all had the opportunity to make pizzas with whatever topping we chose. Each base was rolled out wafer thin and topped with finely sliced tomatoes, ripped pieces of mozzarella, smearings of pesto, chopped olives, onions, olive oil etc etc. We had to be sure that the oven wasn’t too hot by throwing a handful of flour onto the hot oven floor and counting to ten. If the flour burnt in that time it was too hot, so the oven floor was wiped over with a wet cotton mop a couple of times till it had cooled down enough. The pizzas cooked in a matter of minutes, the thin crusts bubbled up and scorched round the edges, like the bestest ever pizzas you could ever wish for. Each one was cut into wedges and everyone ate so many pieces we all lost track of just how much pizza we had eaten. I’m now desperate to start building my own oven. If you’ve caught the oven bug, I we did at the KNEADING conference in Skowhegan, Maine, you might also enjoy the books of Kiko Denzer. Your pizza sounds heavenly. I’m feeling very hungry now and it’s at least an hour until lunch time! Glad to have found your blog again thanks to the mention on Brocante Home. Will add it to my favourites again. Hi! I acquired a book last year on how to construct you own clay oven and I have every intention of doing it this summer, so I was delighted to read your experiences and really how simple it is! Baking bread is one of my passions, so here’s to home and garden baking! Thanks for sharing your pictures! 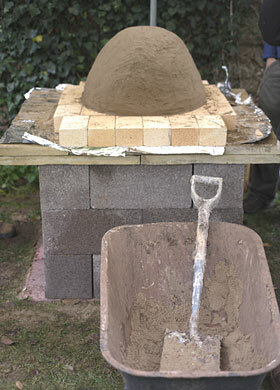 I came across your blog researching a bit about making clay bread ovens, and it looks quite fun and satisfying. If you are interested in an appreciative history of clay, check out “Clay: The History and Evolution of Humankind’s Relationship with Earth’s Most Primal Element” by Suzanne Staubach. This is the book that got me poking around online and thinking about making an oven of my own!